The Strand Homes: MAGNIFICENT CUSTOM HOME IN PRISTINE CONDITION WITH PRIVATE NATURAL PRESERVE VIEW. THIS 5 BEDROOM PLUS DEN, 4 FULL BATHROOMS AND 2 HALF BATHROOMS HOME HAS SO MANY NICE FEATURES. CUSTOM KITCHEN WITH BEAUTIFUL CABINETRY, STAINLESS STEEL APPLIANCES, BUILT IN STEAMER AND HUGE WALK IN PANTRY WITH WILLIAMS SONOMA WOOD SHELVING. MASTER BEDROOM, 2 GUEST BEDROOMS, DEN PLUS OFFICE LOCATED ON 1ST FLOOR AND 1 BEDROOM AND DEN SUITE ON THE 2ND FLOOR FEATURING A STEAM BATH AND A NICE TERRACE TO ENJOY THE TRANQUIL VIEW. CASCADING WATERFALL POOL AND SPA FEATURE AN LED LIGHT SHOW IN THE EVENING AND THE OUTDOOR KITCHEN TO ENJOY WITH FAMILY AND FRIENDS. EXPANDED 3 CAR GARAGE WITH AMPLE STORAGE/WORKSPACE AND EXPOXY FINISHED FLOOR. TOO MANY FEATURES TO LIST. ENDLESS AMENITIES INCLUDING POOL SIDE CAFE. SCHEDULE A SHOWING TODAY TO APPRECIATE THIS FABULOUS HOME FOR YOURSELF. The Strand Homes: Priced BELOW Appraisal! This custom home is privately located at the end of a cul-de-sac, with breathtaking water and golf course views, and professionally decorated makes this a MUST SEE. This is a courtyard style home with a guest house adjacent to the pool. Inside the main quarters this home features tile throughout the living room, kitchen, great room and hard wood floors in both bedrooms and the den (NO carpet here). The master bedroom features 2 large walk-in closets and a private sun porch off of the master bathroom with a huge walk in shower. This home also features a fourth bedroom off of the master currently used as a nursery but has many options such as an exercise room or second office. The kitchen offers expansive granite countertops, a large wine rack, and a long breakfast bar with gorgeous natural sun from the transom windows. The oversize 2 car garage allows room for your golf cart to cruise around the community and still have room for the workbench and added storage. The guest house surrounds the gas heated custom pool/spa and features vaulted ceilings, full bathroom, and partial kitchen. Every window has a Special Storm Protection film so no storm shutters needed! Eden At The Strand The Strand Homes: This award winning Developer-owned home boasts more than 4800 square feet of living space and offers extensive upgrades and top of the line furnishings. The incredible first-floor Master Suite includes a private tower and sitting area that can be used as a home office. A private sundeck on the second floor overlooks the golf course with gorgeous views of the lake, clubhouse, and renowned Naples sunsets. Additional outdoor living space includes a screened porch with outdoor kitchen, sitting area, spiral staircase to the second floor, and access to the attached cabana. The resort style swimming pool area includes a spa, waterfall, slide, and shallow splash pool for the little ones. The attached cabana offers privacy, perfect for guests, with a dedicated entrance. This cabana features a kitchenette, full bathroom, bedroom, and walk in closet. The sitting area could be converted into a media room or a home office. A huge 4 car garage is perfect for the car enthusiast or someone that needs a work area. This incredible home is a must see for anyone looking for a luxury home on a pristine golf course. The Strand Homes: Priced to sell 4bed 4 bath pool/spa home $ 729k. The quality upgrades start in the side entry 3 car garage tech system . Truly compare & take a moment to consider the Quality construction and details We’ve confirmed home cannot be duplicated for the price. Custom ceilings & finishes, Preferred southern exposure , Space to entertain, spacious bedrooms , over-sized master with office/sitting room, formal & casual dining, chef’s kitchen & Jenn-Air appliances , water softener , generator and electric storm protection, surround sound, glamorous master bath Whirlpool jetted tub, bidet, marble vanity top & floors in walk around shower, his and her closets & vanities, fully fitted private lanai for entertaining including wood plank ceiling details, outdoor kitchen, full pool bath. Be sure you compare the fees the low annual 7k covers landscaping , cable, wifi dining & clubhouse 24 hour guard gate & $494/yr adds tennis & health club membership if you like. Easy access to airport and downtown with a north and south gate. Be sure to click on virtual tour to check out the details & floor plan. Furnishings negotiable too! Call now! Golf NOT mandatory. Only good times with family & friends. The Strand Homes: Quality and detail helps describe this over 3100 square ft.home . Spacious kitchen with commercial grade stove and hood with adjacent large island and sink.The lanai is open and yet private with spa & gas fire place ,coconut palms gives it a tropical feel.Come see and compare.Agents please see remarks for additional upgrades. The Strand Homes: H.13722 - This stunning renovation to this residence features sprawling floor plan with large kitchen and huge counter height pull up bar. Fantastic Butler's pantry area is perfect for entertaining in kitchen, dining room and living room areas. Freshly painted interiors in neutral tones with new carpeting and bamboo wood floor accents. Solid core doors and large crown moldings compliment each room. Oversize 3 car side load garage. The large utility room allows for extra storage and work areas. New AC and duct work, stainless steel appliances, new pool motor and renovated pool cage as well as new irrigation system installed. Lovely street just 2 blocks from The Strand main amenity center. Agents see remarks regarding furnishings. The Links The Strand Homes: H.13724 - Enter through gorgeous mahogany double doors to the spacious great room floor plan with twelve foot ceilings and wood plank floors. No detail left undone in this fabulous renovation including a kitchen with Viking refrigerator, Viking range, Viking microwave, soft close wood cabinetry, granite counters, oversize sink and new plumbing fixtures. Plantation shutters in all rooms and gorgeous built-in cabinetry in dining room that is perfect for displaying signature pieces. The Master bath has elevated ceramic vessel sinks and granite counters with Travertine natural stone floors and shower, new plumbing, new lighting and floating shelves. The master closet has been configured with a full closet system. The guest bath has stone counters and vessel sink, new lighting, Travertine floors and shower with seamless glass surround. Other upgrades include in-house stereo system, newer pool heater, enhanced outdoor lighting, rain gutters, epoxy garage floor and electric hurricane rated screens across covered lanai space. A true gem of a property. Sawgrass The Strand Homes: DON'T MISS THIS HOME! Located on a premium lot in The Strand in North Naples, this 3 Bedroom plus den pool home is sure to sell quickly. Recently upgraded featuring exquisite 24" double glazed tile set on the diagonal, a fully renovated kitchen featuring granite counter tops, cracked glass back splashes, and solid wood cabinets. The Master bathroom has also been upgraded with new 24" double glazed tile and renovated shower. The pool area was extended during construction to create a larger living area around the pool with a built in waterfall hot tub. Centrally located on a private lake, the views include lake, golf course and tree line, plus beautiful sunsets! New wood floors in the den and master bedroom only add to the beauty of this home. Interested in energy savings? This home also features a recently installed HVAC system with all the latest features and this system is still under warranty. Are you a golfer? Golf membership available with a discounted fee. Don't wait to view this beautiful home, you will be glad you did! This home is being sold partially furnished. Price negotiable if furniture is not wanted. All items and accessories currently in home are included. The Links The Strand Homes: H.14030 - Lovely free standing property with sunny southern exposure and heated pool and spa. Some of the features of this home include a side load 2 car garage with space for golf cart. Soaring ceilings in the tiled main living area with corner fireplace. The kitchen granite counter tops, eat in kitchen and large utility room adjacent to it. The first floor master suite and guest bedroom/study make it convenient for one story living. The master bath has a seamless glass shower surround, two sinks, soaking tub and large walk-in closet. The second floor loft area is perfect for overflow family and guests and as a second living space. The two second floor guest bedrooms are spacious and separated for privacy. The Links is a popular community with a wide street and lovely landscaped island with Royal palms immediately adjacent to this property. Ana's Place The Strand Homes: H.13782 - Enjoy the convenience of one floor living with master suite and study on first floor and guest rooms and extra loft living area on 2nd floor. This floor plan allows for privacy for every family member or group of friends. Great spaces for TV or play areas for the grandchildren. This property is in excellent condition with updated seamless glass shower in master and and new shower doors in guest baths. Lovely golf course and lake views and properties on only one side of the street. Soaring ceilings make this space perfect for large gatherings of family and friends. Pool bath is convenient for guests as well. Stainless steel appliances and large neutral tile floors will blend with any decor. Many of the mechanics have been updated such as AC, pool heater and pool pump motor plus resurfaced pool deck. Enjoy the working fireplace on those cool winter mornings. Four bedrooms and 3.5 baths make this perfect for lots of family and guests. Electric and manual storm protection in place. Agents see remarks. Sawgrass The Strand Homes: Beautiful lake and golf course views. This 4 bedroom 31/2 bath home offers a first floor den plus a second floor loft, 2 car garage and a pool. The kitchen has been remodeled and offers stainless steel appliances, upgraded cabinets, plenty of storage, granite and an oversized island perfect for gathering, entertaining and prepping food. Other features include an updated master bath with multiple shower heads, freshly painted interior, new carpeting, vaulted ceiling, built in cabinets, fireplace, open floor plan second floor balcony and an outdoor kitchen. The Strand offers non equity golf memberships. Enjoy the active Florida Lifestyle, The Strands mandatory social membership offers pickle ball courts, State of the Art Fitness Center, Resort Style pool with food service, tennis, fine dining at the Clubhouse and an array of social activities. Close to shopping, dining and just a short drive to Naples beaches. The Links The Strand Homes: H.13769 - Nestled In The Private Location Of "The Links At The Strand" With 54 Single Family Residences. Located On One Of The Nicest Oversized Golf Course Lots. Brand New Roof. This Mult-Story Home Layout Has All Your Active Living Space On First Floor Including Master Suite, Expansive Great Room With Volume 19 Foot Ceilings & Fireplace, Den With Attached Half Bath & Walk-In Closet, Island Kitchen w/ Granite Countertops & Laundry Room. The Upstairs Modified Floor Plan Has The Cozy Game Room / Loft Area, Guest Suites With A Second Added Full Bath Provide Enough Room To Host All Your Children, Grandchildren And Guests. Both Great Room & Master Suite Have Direct Access To Outdoor Lanai/ Patio Area With Built-In Grill, Heated Pool & Spa. 2 Car Garage Plus Side Loading Golf Cart Garage. High Definition Cable, Internet, Lawn, Master Fee, Irrigation Is Included In The Low Quarterly Fees. The Links The Strand Homes: The Links at The Strand Beautiful home and great location in the popular Links neighborhood at The Strand. Great room with vaulted ceiling, fireplace and hardwood floors is inviting and perfect for entertaining. Walk out through a wall of sliding glass doors to a beautiful extended paver lanai with very private pool and spa, and sweeping views of the Savannah golf course . Large eat-in sunny kitchen with stainless steel appliances and recessed lighting opens to dining/living area with custom built ins and wet bar. Enlarged master bedroom suite has sliding glass doors that open to lanai. Master bath with dual sinks, separate tub and shower are bathed in natural light. Upper loft/ lounge area with 2 beds/1 full bath is perfect for guests. Den/office has walk-in closet and large windows. This spacious home offers ample storage with walk in attic, expanded two car garage and includes separate golf cart entrance. It is the perfect home to feel tucked away in a gated community, yet close to golf, tennis, grocery, boutique shops, restaurants, entertainment and the sun-kissed beautiful Gulf beaches. Great location, great value! Eden At The Strand The Strand Homes: Living is easy in this impressive one of a kind Eden at the strand model!! Enjoy the panoramic views from this gorgeous 3 bedrooms 2 baths dream villa home. Highlights included a very open floor plan with vaulted ceiling, tile flooring throughout living, dining and kitchen and wood flooring in bedrooms, elegant formal dining room, wood kitchen cabinetes with granite countertops and stainless steel apliances, a divine master suite with tray ceiling with beautiful views with an ensuit tile bath with tub and shower, crown molding throughout the house, laundry room, 2 car garage. Feel like you are in vacation everyday with this spectacular panoramic western view overlooking the lake from this voluminous screened patio with heated pool and spa. You’ll also love the convenience walking distance to the Clubhouse, Fitness Center and Tennis Courts. Eden At The Strand The Strand Homes: Gorgeous, rarely available, two story villa with breathtaking lake and golf course views and walking distance to Club pool! This home has ample space with 3 bedrooms, 2.5 baths plus den! Master bedroom is on main floor w/ tray ceiling, bay windows overlooking the golf course, and spacious master bath with walk in shower, dual sinks and luxurious tub. Second floor holds two bedrooms with a Jack and Jill bathroom and loft area which can be used many different ways to suit your lifestyle. Upgraded eat in kitchen with granite countertops and backsplash, recently installed stainless steel appliances & desirable white cabinets. Main floor offers formal dining room, living & family room while still maintaining an open floor plan concept. Outdoor living at its finest with an upstairs balcony and also lower level lanai area with Southern exposure, covered & uncovered sections for the ultimate experience. This home comes furnished with very tasteful and professionally decorated decor. 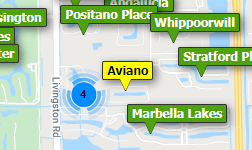 Prime North Naples location - quick access to beaches, dining & shopping options. Social Clubhouse with state of the art fitness center, 27 hole golf course (Membership Optional), and junior olympic size pool. Mango Cay The Strand Homes: This two story single family home offers three bedrooms plus loft, two and half bathrooms, with Private heated pool and spa! The home is nestled in plush landscaping within the private Mango Cay community by the Strand. The leisure room overlooks the pool/spa area and the spacious kitchen area includes granite counter tops,stainless steel appliances along with a built in wine rack! All bedrooms are located on the second floor with an open loft, great for an office or family room play area. The guest bedrooms are spacious with lots of natural light. The master bedroom has a wonderful, large master bath with a soaking tub and separate shower and the stunning walk-in master closet is custom finished. Eden At The Strand The Strand Homes: V.2847 - Carefree living in this beautiful villa with wide golf course views and large screened lanai space featuring a stunning water feature. Large tile in main living areas and carpet in bedrooms. Kitchen features stainless steel appliances, quartz counter tops, tumble marble back splash and solid wood cabinetry. Closet cabinets in master bedroom and guest room. The den has a partial closet that can be finished so that the room can be used as a 3rd bedroom. Dining room could be used as a den as the breakfast area is spacious and can accommodate a large table. Sellers are motivated to move on! Convenient location within community. Short walk to The Strand clubhouse & amenities.